Because of the terrible weather the last few weeks have been quite slow. On the CBC I heard that New Brunswick is experiencing a record low year for forest fires, both in number of fires reported and total area burned. Only two hectares have been burned all year! That is a sure sign of the cool wet year we’ve experienced. Despite the generally poor weather I had a couple interesting reports from the past couple weeks. The first was a very fresh Northern Blue photographed at Hartlen Point in Eastern Passage by Rita Viau. The photo was taken August 1st, which is typically right at the end of the species flight period. Check any coastal headlands for this species in the coming week, we may be able to get some really late dates for it this year. The second was a Striped Hairstreak recorded by Eric Sullivan on August 5 just NW of Miramichi. This is a great time of year to be looking for Common Branded Skipper, or Laurentian Skipper as the local subspecies is known. This species is common in New Brunswick (S5), fairly common in PEI (S4) and uncommon in Nova Scotia (S3)*. So far in the Atlas it has been undersampled; there were only 11 records from 2010 (9 from NB, 3 from NS). This species is found in a variety of open habitats, including meadows, coastal headlands, coastal marshes and even bogs. A great spot to look are dry forest openings, the sort of place you’d see Pink-edged Sulphur. Common Branded Skipper can be distinguished from other Maritime skippers by the very bold white spots on the underside. 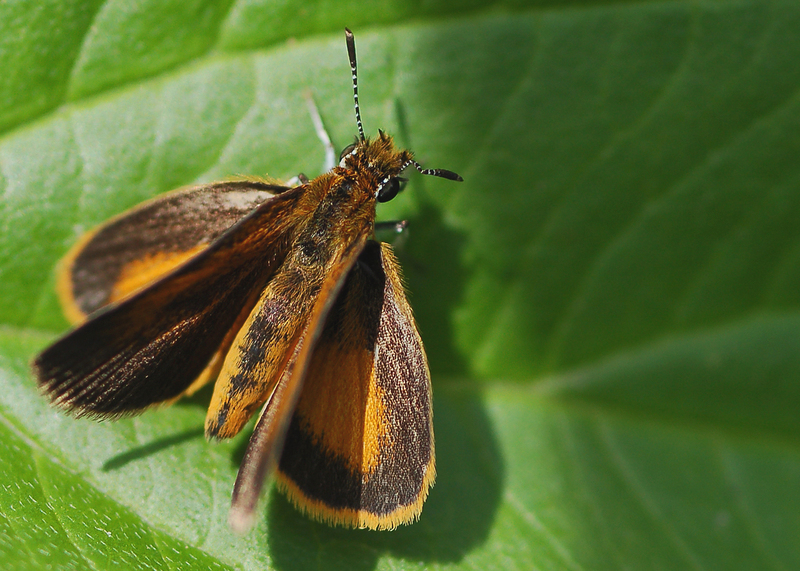 Our other orange skippers have more subtle underside markings. There are also few other skipper species on the wing this late in the summer. Common Branded Skipper. Photograph by Denis Doucet. Another skipper to have on your radar is Least Skipper. 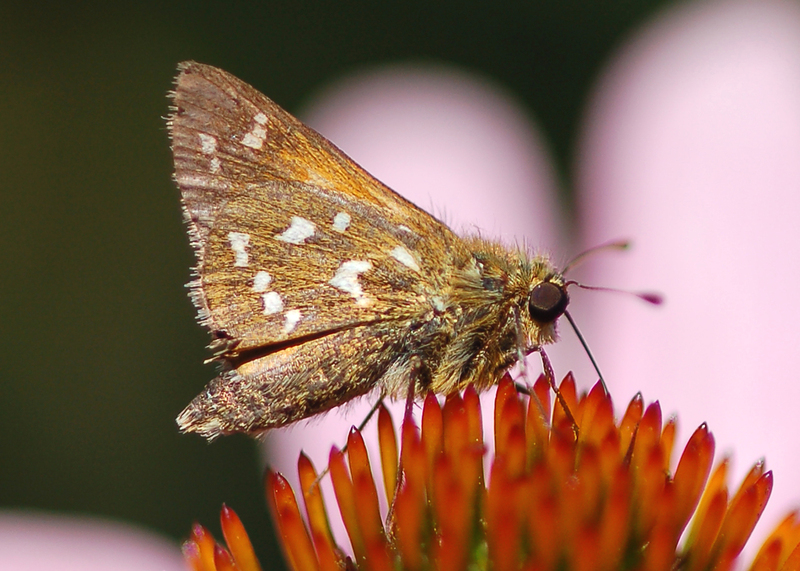 This small plain skipper is most similar to European Skipper. It can be distinguished by its sleeker profile and dark scaling on the forewing upperside (check out http://accdc.com/butterflyatlas/Least%20Skipper.pdf for more details). Least skipper has two generations annually: the first flies late June to mid July, the second flies mid August to early September. Look for this fairly common but easy to overlook butterfly in wet grassy areas such as ditches and marsh edges. Least Skipper. Photograph by Denis Doucet. *For an explanation of the S-Ranks (S5, S4, etc.) take a look at the bottom of the species checklist (http://accdc.com/butterflyatlas/Checklist.html).